First Class post graduate in Sanskrit Literature from Banaras Hindu University in 2001. First Class graduate in Sanskrit Literature from Banaras Hindu University in 1999. B. Ed. From Rashtriya Sanskrit Santhan (D.U. ), New Delhi, 2002. Qualified National eligibility test and awarded by junior research fellowship in December 2002. 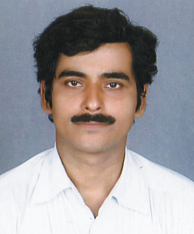 Appointed as an Assistant Professor of Sanskrit in the Department of Sanskrit, Sri Ganesh Rai Post Graduate College (V. B. S. Poorvanchal University, Jaunpur) Dobhi, Jaunpur, by Higher Education Commission of U. P. (Allahabad) in July 2005. From 01.09.2005 to present session, total seven sessions of Graduation level students are taught. विश्वभारती, खण्ड-५२, अंक: १-२, २०११ ई. ‘Aryashatakam’ is a famous and unpublished work of Appay Dixit. A rare Mss. Of said Shataka is preserve in my own collection. In present paper I discussed in detail about the author, his work, its importance and place in the history of Sanskrit literature. According to the Mediaeval History of India, the Muslim rulers from every dynasty were contributed to Hindi in there own territory. The historical facts, archaeological evidence, coins, and many other historic materials are prove there attentions towards the Hindi. In present paper I have discussed in length about the topic. A rare Mss. of said Kavya is deposited in Nagari Pracharini Sabha, Kashi. In this paper I discussed the source of prahelika, and about the author of the work and his period. Explanation of the six seasons with there great beauties in Epics of Sanskrit literature, seems a traditional technique to present the charms of this literature and the preeminent talent in poetry of a poet. Thus, numerous poets of Sanskrit have been created a great literature on this unique subject. In present paper I took my attention on the history of this writing and offered the readers to enjoy the charms of summer (ग्रीष्म) with some quoted stanzas from rare poets. ‘Bhringashtakam’ composed in unknown period is very famous work in the history of Sankrit literature. Some stanzas from this kavya may found in the works of Bhartrihari. I took attention for them according to appropriate author and discussed about the Manuscript in this paper. The date of Acharya Shankara (787 A.D.) is well-known in History of India but a branch of historians, do not accept this period. If their opinions are true then this date might be 500 B.C. In this paper I discussed both opinions of scholars and paid attention towards the period of Shankar i.e. 787 A.D., as prescribed in Manuscript. A singular manuscript dated 1886 of this composition found in Sabha. According to Mss. the nature and kinds of Nayikas were discussed in paper. Sriram Sharma is newly discovered in history of Sanskrit poetics. Baravai is a famous meter in Hindi literature. According to the evidence of literary use of this meter, either Tulasi or Rahim was the first poet who used this meter in his poem. The percentage of scholars in favor of Tulsi is too rich but it is the fact that the first user of this meter was Rahim and Tulasi Influenced to write in this meter from request of his friend Rahim. In this paper I have searched the conceptions of Aesthetics in the works of Kalidas. Biharilal a great poet and his Biharisatasai is a great poem in Hindi literature. Raja Cheta Singh (The king of Kashi in 1771-1780 A.D.) made a translation of Satsai in Sanskrit named Biharisapta Shatika. At the instance of Raja the court-poet Pt. Hariprasad translated the Hindi Satsai in Sanskrit in ARYA meter. This Mss. Firstly discovered in this century and having great importance to literary view. अनुवाद (त्रैमासिक) अंक-१२५, २००५ ई. भारतीय अनुवाद परिषद्, नई दिल्ली. This is the reproduction of above paper (published in नागरीप्रचारिणी पत्रिका, अंक-४/२००५ ई.) The editorial board of Anuvad has decided to reprint this paper again in Anuvad and I have discussed especially about the talents of the translator, reflected in his work. उत्तर प्रदेश संस्कृत संस्थान, लखनऊ. A singular hand-written copy of said book is preserved in Sabha. Vishnutattwaprakash is belongs to Pancratra Agam and unknown to Agam-Tantra literature. A Short notice about Mss. and its author and time is the subject of the paper. संगमनी, वर्ष-३३, अंक-१, २००४ ई.
Courkavi is well-known poet and his Chourpanchashika is high-ranked poetry of Classical Sanskrit literature. In this small poem the author presented many adjectives (Visheshana) for showing charmness, loveliness and pleasant appearance of his Heroin. These visheshana are explained in paper with view of Kamshastra. The 18th centurian translation of Prabodhachandrodaya in Hindi by Brajwasidass and Nanakdass is based on a Persian translation of same drama but this fact is much unknown in history of Hindi literature. The persian translation of Prabhodha chandrodaya belongs to Md. Dara Shukoh, of Mughal Dynasty. It is famous in Indian Mythology that Raja Harishcandra was sold in Varanasi and serviced under Dom-raja at the bank of Ganga. This misapprehension coming from a long period and that may be 2000 years ago, but none of the scholar or a writer or a civilian took attention regarding it (in my notice). We know that Ganga came out on the earth by the strenuous effort of Bhagiratha and he was the 14th descendant of Raja Harischandra. The first literary evidence found in 10th century whenever a Dramatist, named Arya Kshemishwar presented Harishchandra on the bank of Ganga in his famous drama Chanda-Koushikam. From Kshemishwar to present time this misinterpretation is coming without any discussion against the fact. This paper is a supplementary for a same topic, worked in 2002. See below. Paper is based on a rare and singular hand-written copy of Advaitprakasha, an extraordinary work on Philosophy, completed at the request of Md. Dara Shukoha in 1656 A.D. The author, Vanmali was high-learned secretary of Dara and translated many Sanskrit books in Persian for his prince. This paper is a supplementary of above no.14, wherein I talked about the life and works of Vanmali Dass, with help of Contemporary evidence. स्वरमंगला, वर्ष-२७, अंक-४, २००२ ई.
Namavirudawali is a collection of the names of Vishnu with defination and explanation, quoted in various Smritis, Puranas etc. Kishori Ali (1775-80 A.D.) was a disciple of Lalita Sampradaya. The Mss. is preserved in Sabha. In this paper I have discussed about the life and works of author. निसर्ग-कन्या क्या सच ही दुष्यन्त की सम्पत्ति थी? संस्कृत-संजीवनम्, अंक : ३-४, वर्ष-२००२ ई. बिहार संस्कृत संजीवन समाज, पटना. जनवादी संस्कृत कविता – दशा एवं दिशा National seminar on समकालीन संस्कृत कविता में युगबोध organized by Rastriya Sanskrit Sansthan, held at M.G.K. Vidyapeeth Varanasi, March 2011. कालिदास-साहित्य में मानवाधिकारों की गवेषणा ‘Kalidas Samaroha’ 2003 Kalidas Academy & Vikram Universiry, Ujjain. 21 days ‘Orientation Course’ held at U. G. C. Academic Staff College, B. H. U. 2006 A.D.
Refresher Course in ‘1st Comparative Literature’, held at A.S.C., B.H.U., 2012 A. D.
15 days workshop on SOURCES AND FANDAMENTALS OF JAINISM organized by Indian Council of Historical research (ICHR), New Delhi, held at Parshwanath Vidyapeetha, Varanasi, February-March 2011 A.D.
Second prize in All India level essay competition on एकविंशशताब्द्यां संस्कृत-कविता organized by शान्तिनिकेतन विश्वविद्यालय, प.ब., in 2001. First prize in साहित्यशास्त्रपाठ in university level competition, held at संस्कृतदिवस-समारोह, B.H.U. in October 1998. First prize in साहित्यशास्त्रार्थ in university level competition, held at S.V.D.V./B.H.U. in October 1998. First prize in संस्कृत-आशु-भाषण competition on university level, held at केन्द्रीय संस्कृत विद्यापीठ, लखनऊ, in 2002. First prize in Sanskrit debate, held at above mentioned venue. ‘पण्डित गौरीनाथ पाठक रजत-पदक’ for standing first in a Sanskrit debate in 1989 A.D., held at शारदा-भवन-गणेशोत्सव in Varanasi. संस्कृत-कवि-प्रतिभा-पुरस्कार for writing poems in Sanskrit. By त्रिस्कन्धज्योतिषम् (an Institute of Astronomy in Varanasi). Work and research in Sanskrit Literature through Indian History, Archaeology, Numismatics, Manuscriptology etc. Publish the unknown Literature of Sanskrit and Hindi, found in Manuscript form in various Manuscript collection of India and abroad, as possible. Original Sanskrit works of Muslim scholars. Translated works of Sanskrit in Arabic, Persian and Urdu languages. Translated works of Arabic, Persian and Urdu in Sanskrit language. Translation works from Sanskrit, in Indian and Abroad languages. Translation works in Sanskrit, from Indian and Abroad languages. Materials on ‘Adhunik and Janvadi Sanskrit Kavita’. Organise Sanskrit Speaking and translation Classes for higher Sanskrit studies. Languages known: Sanskrit, Hindi, Urdu, English, Mythili, Bangla, Marathi, Guajarati. Collection of Manuscripts, old and Lithographed Books, portraits of scholars. Interest in the ‘आधुनिक एवं जनवादी भारतीय कविता’. Indian classical music, playing ‘Tabla’, singing Maithili-Geet, and the अष्टपदी of गीतगोविन्द of जयदेव. Indian Art, Mughal, Pahari and Madhubani paintings.